Our new house is a farm-style home based loosely on a floor plan we found on the internet. Tom Oakley of Oakley Designs took our rough concept and helped us finalize it. We substantially reduced the square footage from the original plans by dropping some of the rooms upstairs and reworking the mudroom. We also moved the back porch over to one side, and left the backyard open for a deck at some point in the future. 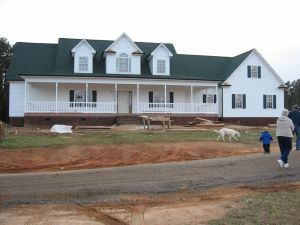 The home has a large front porch which wraps almost completely around the front of the house, and a two (rather than three) car garage. The main living room is open to the second story, and is bracketed by a balcony on one side, and a wall of windows on the other. The house is built with a crawl space, and the area over the garage is unfinished storage space. The entire house is wired for high speed data as well as surround sound. There are an average of 2 data connections in each room. The living room is wired for 5.1 or 7.1 surround sound, while the back porch is also wired for external speakers. We selected Blackwelder & Associates based on their impressive resume and word-of-mouth recommendations. 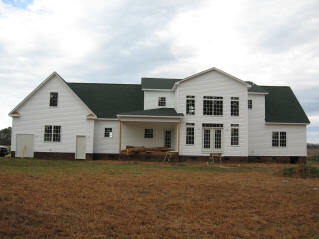 To see additional photos of the new house updated regularly, click here.